Climate change is one of the biggest environmental and development challenges of the 21st century. But we will not all face this challenge in the same way, as the impacts of climate change are unevenly distributed; people that are marginalised in society are especially vulnerable to climate change because of intersecting social processes that create multidimensional inequalities. Climate change and the inequalities in its impact are a key challenge for social protection programmes aimed at combating extreme poverty in the Global South. Climate change is likely to intensify the types of risks that those enrolled in social protection programmes will experience in the future. However, there are few projects that integrate both climate change resilience and social protection objectives, despite both aiming to reduce the risks experienced by vulnerable people. Later this year I will carry out research examining what the ‘Infrastructure for Climate Resilient Growth in India’s (ICRG) experience can tell us about the effects of building a climate resilient social protection approach in Mahatma Gandhi National Rural Employment Scheme (MGNREGS) and other public works programmes. How can social protection enhance climate resilience? Note: These categories of interventions may overlap. For example, public works programmes both ‘promote’ incomes as well as ‘prevent’ deprivation as they aim to transfer short-term cash (prevention) and build long-term infrastructure (promotion). When examining the linkages between social protection and resilience, it is important to consider how different types of social protection instruments affect the nature of resilience and its effects on vulnerability. Are public works programmes enough to facilitate innovation to climate change? Is a diverse mix of instruments crucial to building more proactive forms of resilience? 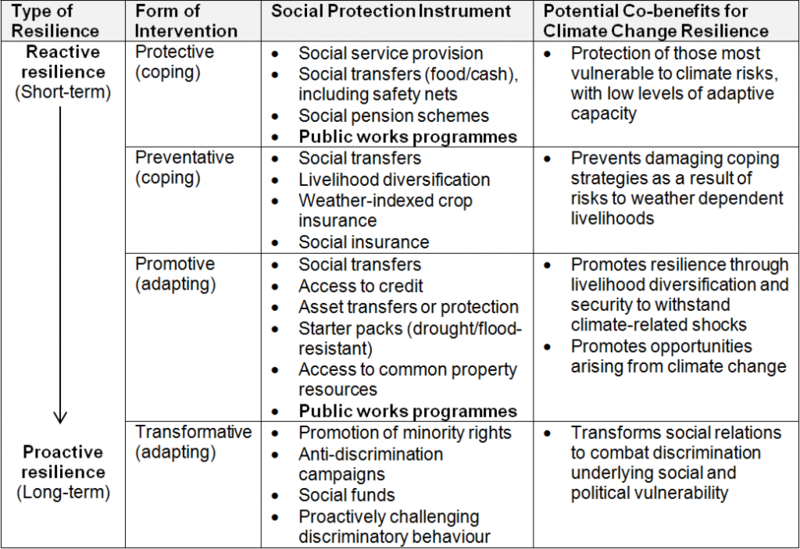 Social protection can also be considered a component of resilience as it has the potential to address different forms of vulnerability, in particular, the preventive, promotive and transformative components of social protection. 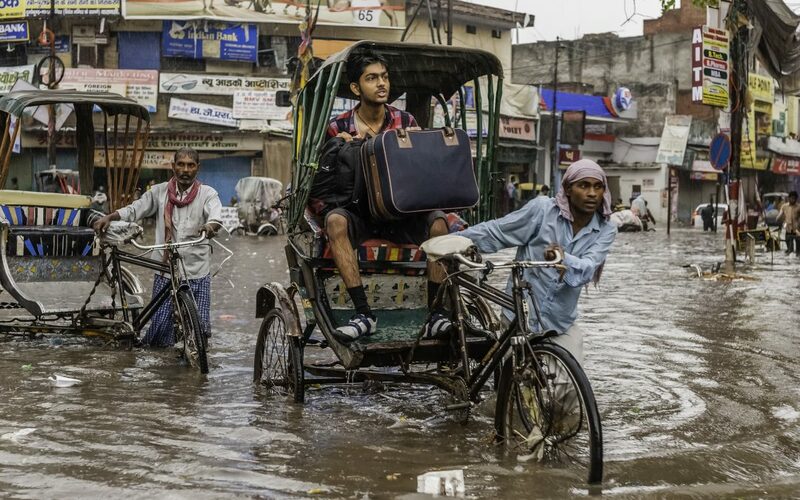 India is one of the most vulnerable countries to climate change, with a projected agricultural loss in 2030 of more than US$7 billion (ECA, 2009). Despite India’s central anti-poverty scheme, the MGNREGA, also being a part of India’s climate change strategy, there has been a limited examination of its potential co-benefits for enhancing the resilience of the most vulnerable to climate change. Assessing the potential of ICRG to address uneven gender dynamics in the context of improving the resilience of households, but also more specifically to enhance the ability of women to respond to climate change. How social protection can reduce vulnerability, particularly for women in the context of critical transformations like climate change. Social protection programmes are increasingly recognised to have the potential to help the poorest enhance their resilience to climate change. A climate resilient social protection approach can set in place pathways towards radical or transformative change by addressing the fundamental root causes of vulnerability to climate change. However, there is limited empirical evidence of these benefits and challenges of its implementation in practice. Once I’ve undertaken the research, I’ll be back to outline what the ICRG experience can tell us about building a climate resilient social protection approach in MGNREGS and other public works programmes. This blog is based on a study conducted for the Infrastructure for Climate Resilient Growth Programme in India as part of a consortium led by IPE Global that has been awarded £5 million over 3.5 years by DFID to support the Government of India to address India’s climate change challenge.